The temperature did not rise above 43 degrees F during my sale yesterday. I ended up layered in hand-knits. It took a bit of digging to locate my knitted items because it was summer a week ago! The whole box of acrylics sold later. What didn't sell were the rubber stamps, and I had really great stamps for sale! I didn't sell a single set of Stampin' Up stamps (which are top of the line, for those of you who do not stamp). In five hours I made about $140. Not terrible, but not great, either. 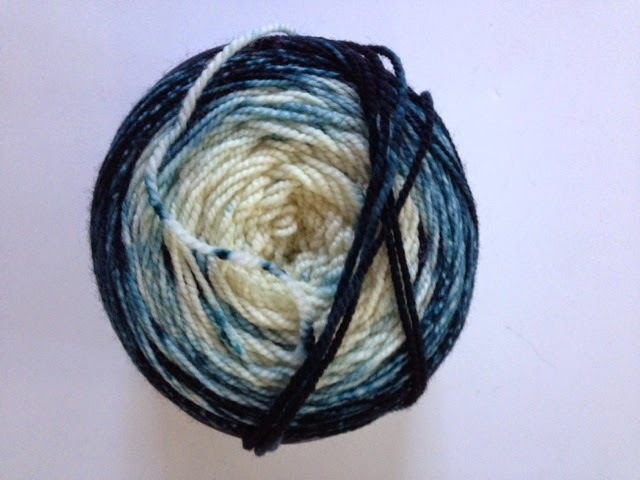 I did not knit after shutting down the sale. I napped, which is very unusual for me. I think the cold wore me out! Friday's dinner went really well. The other family I invited is vegan so I made Ratatouille and my friend made a bean dish. My mom brought fruit salad and brownies. I think everyone had a good time. For the Ratatouille I pulled out the original Moosewood Cookbook. I have to say that the result was disappointing. Vegetarian cooking has gotten a lot better since the 1970s. I'm going to brave another cold morning today to get some exercise, biking with a couple friends. Then I need to buckle down and do some work that I brought home from school. Almost time for another week! 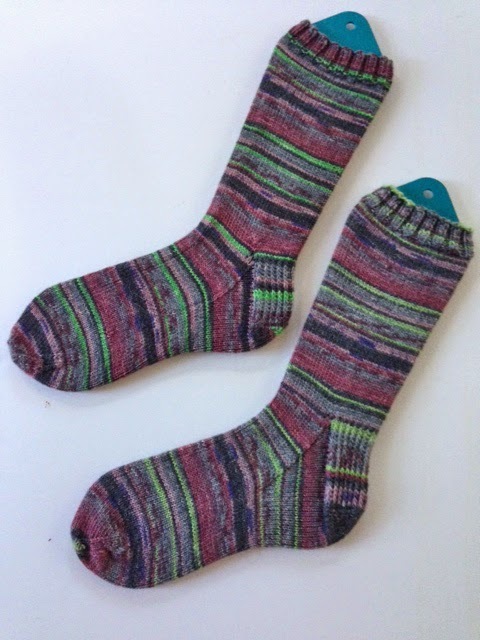 FO Friday: Can You Stand Another Sock? 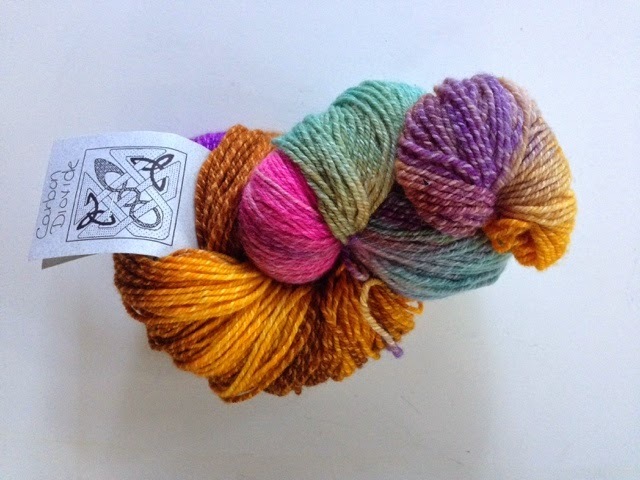 It's a Plain Vanilla Sock in Opal's Little Prince colorway. 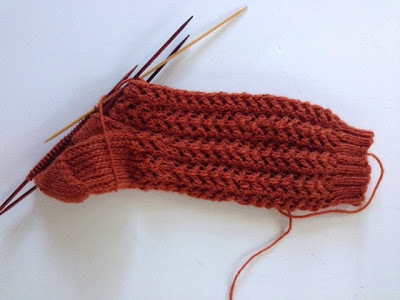 There's no such thing a a bad Opal sock, and I love the finished product, but this was kind of tedious to work. I guess I enjoy their colors that form faux-Fair Isle patterns better. It's going to be a frantic 24 hours for me. I am making dinner for 8 this evening, and then my Crafter's Destash yarn sale starts at 8 tomorrow morning. Did I mention that I have to work all day? When the sale ends, I think I'm going to put my feet, queue up Netflix, and indulge in some mindless knitting! 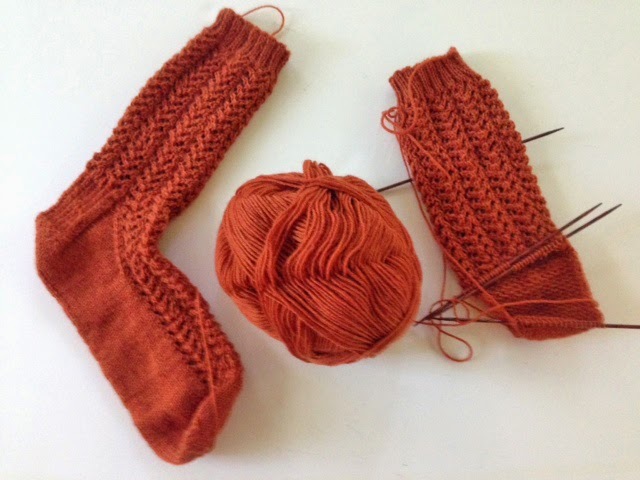 Still working on the Autumn Trellis socks. If you tuned in last week, you can see that progress is slow. 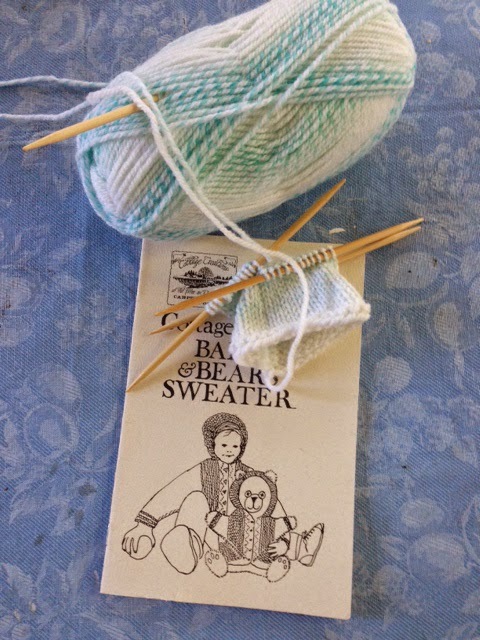 I'm not a slow knitter, but this pattern is sure going slow for me! I think that the issue is the type of double decrease used to create the lace pattern: You slip two stitches as if to knit 2 together; then you knit the next stitch; and lastly you slip the two slipped stitches over the knit stitch. It takes me a few seconds to make sure I'm picking up both the slipped stitches. I know I could probably shop for sharper needles, but I simply own too many needles to even want to add another set! Do you have any experience with this type of double decrease? I got through the first five days of school with no major bumps! I can see that this is going to be an unusually hectic year. My students have a wide range of academic abilities, so I will be making lots of modifications in curriculum. I have some students with challenging behaviors, but I seem to be establishing good relationships with them, so I'm feeling optimistic! 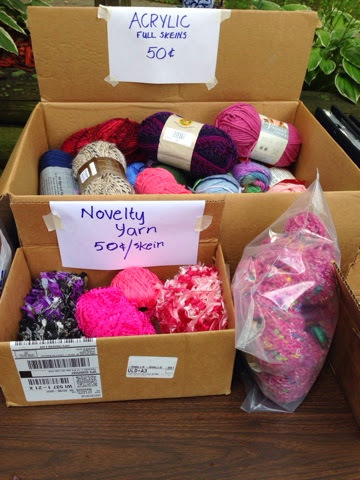 In the meantime, I am frantically organizing and pricing items for my Crafter's Destash Yard Sale, set for Saturday. Keith put up a notice on Craig's List, so I have to be ready! 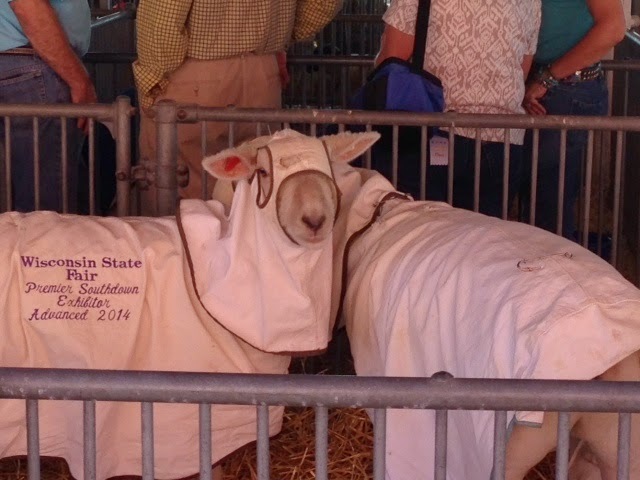 I actually think I was admirably restrained at the Wisconsin Sheep and Wool Festival this past weekend. 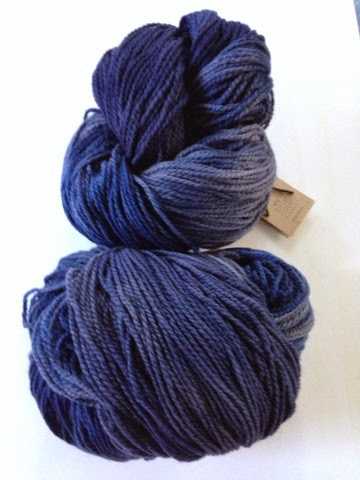 I did, however, make one MAJOR "investment" in two huge skeins of Briar Rose Sonoma, a heavy worsted weight wool. Pretty huh? It is destined to be a Harriet's Jacket. There was a sample of this adorable sweater at the Briar Rose booth, and I just fell in love with it. With three unsuccessful sweaters behind me, I actually think that this is one that I can complete. I'm even going to swatch! We noticed that the ombre style of dying is really popular. Most of of them were packaged in cakes like this one. The real color is more green-blue than it looks in this photo. It's Coloration from Ogle Design, which is based in St. Francis, Wisconsin. I love the way shawls look when they are knit from these skeins. And this one was on sale! It is Sweet Feet by Interlacements. Yes, I love wild colors. I think this will make a really fun hat. My mom was a bit horrified that I bought more yarn. I don't think I've been successful in convincing her that a stash is a good thing! 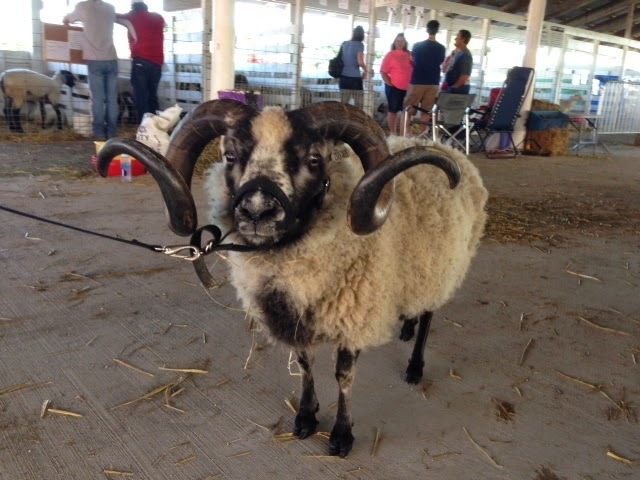 I spent the entire day yesterday at the Wisconsin Sheep and Wool Festival yesterday with my friend Suzy, and we had a great time. It was a perfect September day, blue sky and just cool enough to wear a lacy cowl. I met Suzy at my writing program this past summer, and this was the longest time we've spent together. We were talking a mile a minute, which turned out to be somewhat of a problem ... but I'm getting ahead of myself. 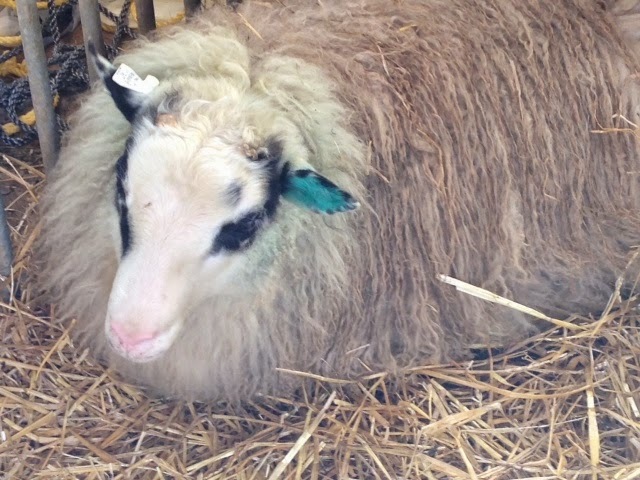 More and more, I value this event for reminding us of where wool comes from. 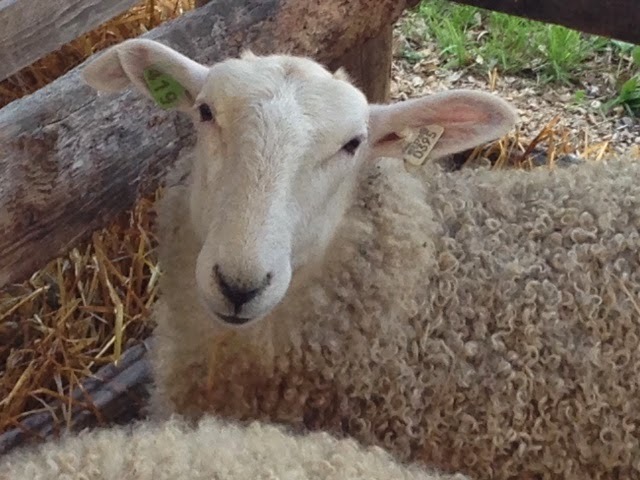 Animal-sourced yarn is not primarily a manufactured product -- nor is lamb, for that matter. 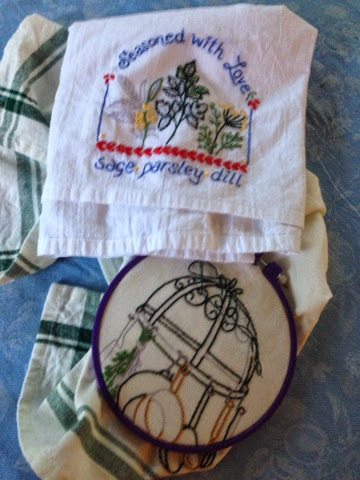 We knit and eat thanks to hard-working farmers. In my last newspaper job, I covered agriculture for Madison's morning paper, and I quickly learned that I could never have made it in farming. No one works harder -- with less job security -- than these folks. Farmers are also smart -- and often very funny. This fellow above lives on a farm called Queso Cabeza in Olivet, Michigan. We knew right away that this family had Wisconsin roots because the English translation of their name is Cheese Head (Go Packers!). I could not help but calling them: Ku Klux Lambs (get it???). I have to add that I am sure that this is purely coincidence and that the owners are wonderful people. And one other coincidence. We discovered that Suzy's best friend during her childhood lived in the house that I now live in (she hadn't been to my house, yet). Is that weird or what? So, back to all that chatting. Suzy and I paid no attention to where we parked the car. Thankfully, the weather was beautiful, because we walked almost the entire parking lot before finding my car! It is quite rare for me to have a two-week gap in blogging. I think I can genuinely blame my job. Between trainings and getting ready for the new school year, I have been working 12 or more hours a day. I'm hoping all this preparation will pay off when the students show up today. At any rate, I do apologize to my blog friends and I promise to catch up with my blog reading this week! 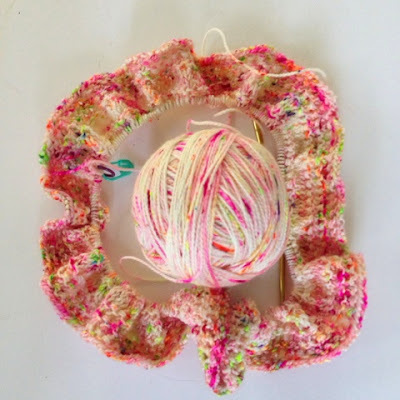 Though I haven't been blogging, there has been knitting. 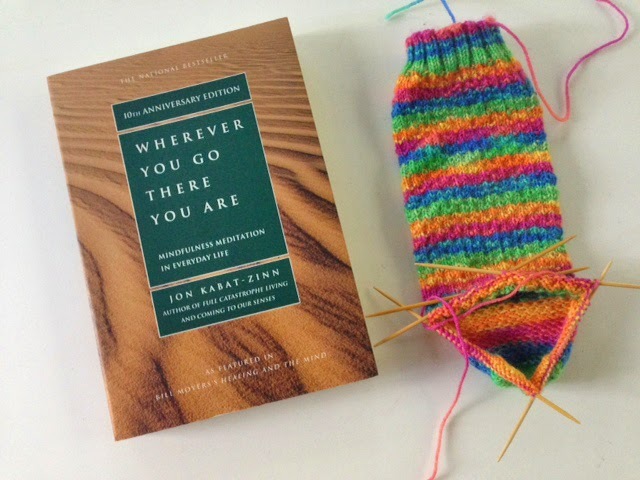 I've been focusing on this pair of socks because it is going to be a holiday gift. Its an original design, and I do like the way it looks. It feels even better, I discovered when I finished sock No. 1. I do find that it's a slow lace pattern, so I am determined not too leave it until the last moment. While it looks like I'm going to have a lot of challenging students this year, I am trying to stay focused on the positives. Right now I am grateful that my own children are doing well. They both started graduate school last week and are happy with their programs. A mom really can't ask for more. And this afternoon, I stopped at Walgreens to pick up key locks for some students who can't manage combinations. I ran into a student from 5 or 6 years ago. I gotta say that this kid was kind of a mess in 8th grade. However, it turns out that he graduated from high school and has a full-time job with a pest-control company. I would like to think that my work does a little bit of good in the world.